With Freddy Krueger determined to haunt Elm Street after lying dormant for close to a decade in hell, the serial killer enlists in the services of Jason Voorhees to recoup his power by killing the citizens of Springwood. However, as Freddy would soon find out, it’s nearly impossible to have two iconic slashers coexist peacefully without declaring all-our war. Thus, the battle between Freddy and Jason is born. 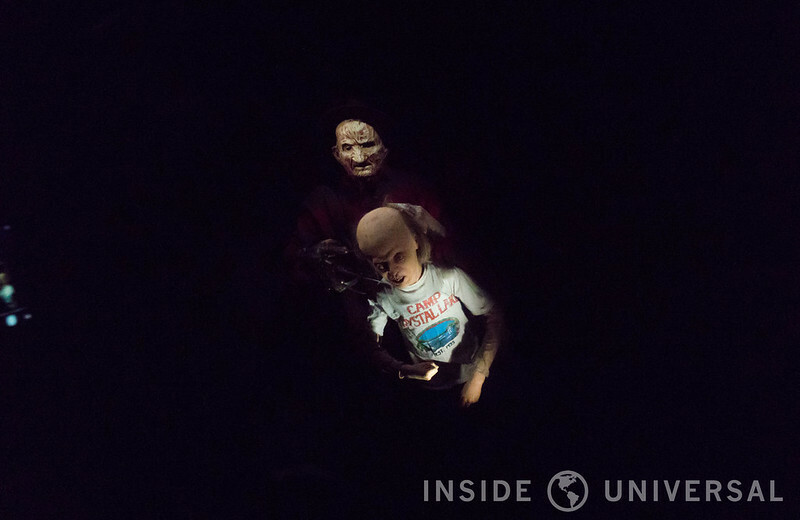 Bringing together two of horror’s most infamous icons and inspired by the 2003 film that bares the same name as the maze, Freddy vs. Jason pits two titans against each other in what is arguably Hollywood’s most action packed experience. 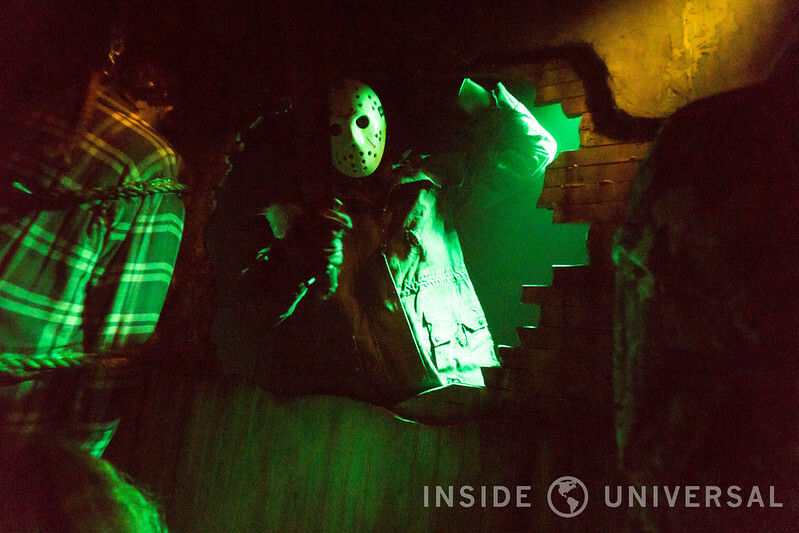 Located on the famed Universal Studios backlot, Freddy vs. Jason is housed in a tent in front of Soundstage 747 with an elaborate factory façade. 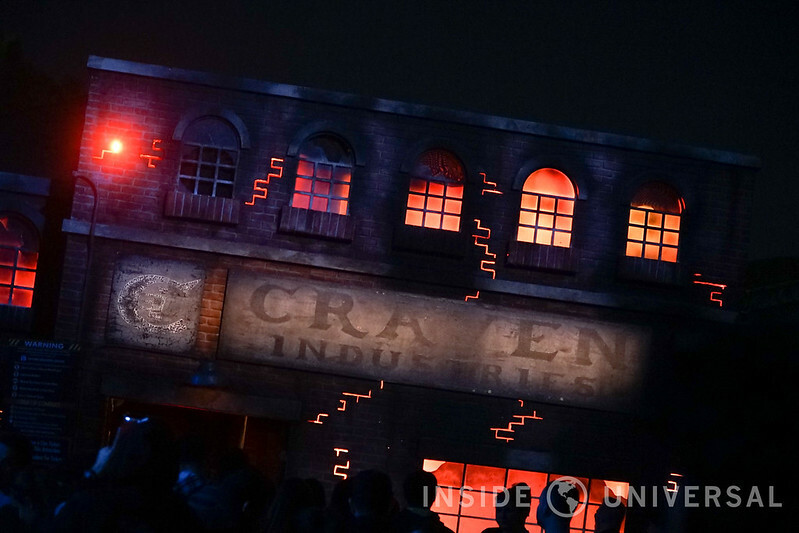 A marquee for Craven Industries – a nod to Wes Craven, the creator of A Nightmare on Elm Street – adorns the entrance of the factory, with crackles and flames bellowing inside. 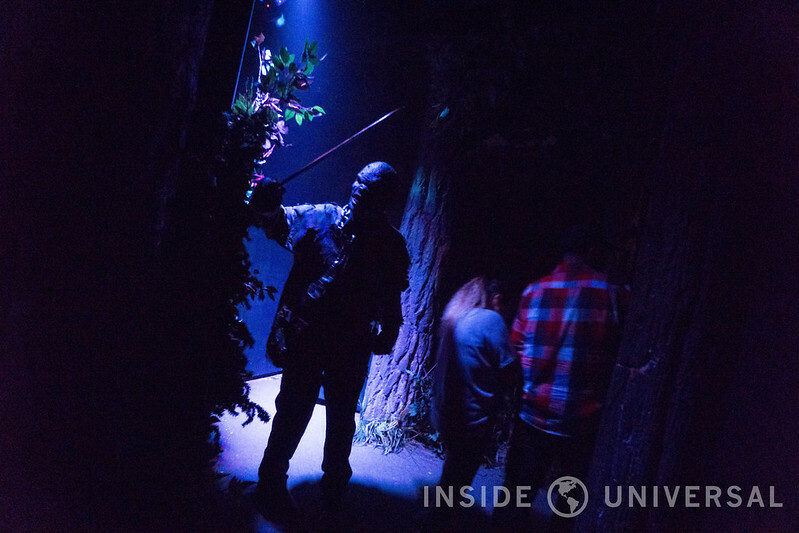 As you enter Freddy’s Lair, you’ll recognize several classic scenes from the Nightmare on Elm Street franchise, including the iconic Freddy Snake from A Nightmare on Elm Street 3: Dream Warriors. 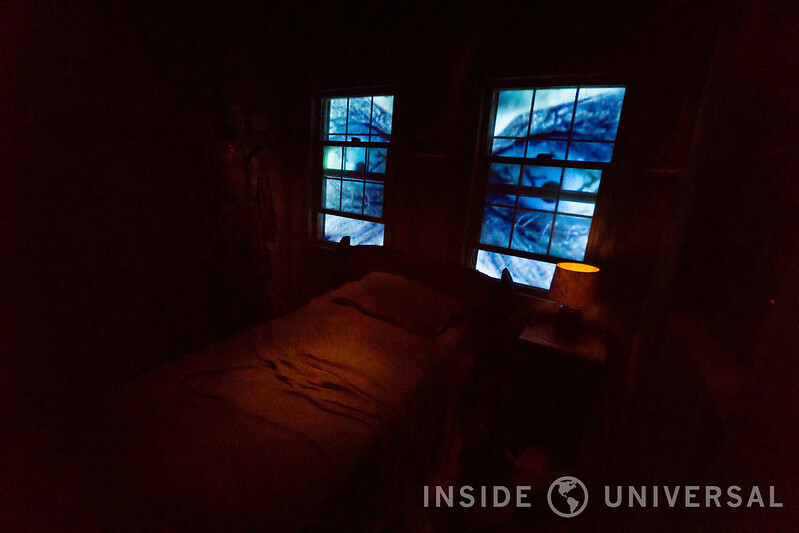 Though not terribly frightening (nothing can replicate the impact of a scare actor lunging at guests from a variety of angles), this scene offers a refreshing reprieve from the jump scares that lie further in. It’s a simple animatronic, but one that acts in an effective manner due to its close proximity to guests. 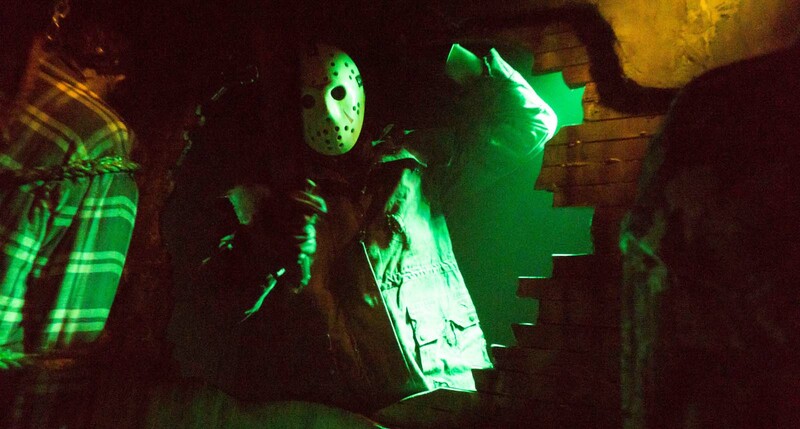 Of course, a Freddy vs. Jason maze wouldn’t be complete without Jason Voorhees. 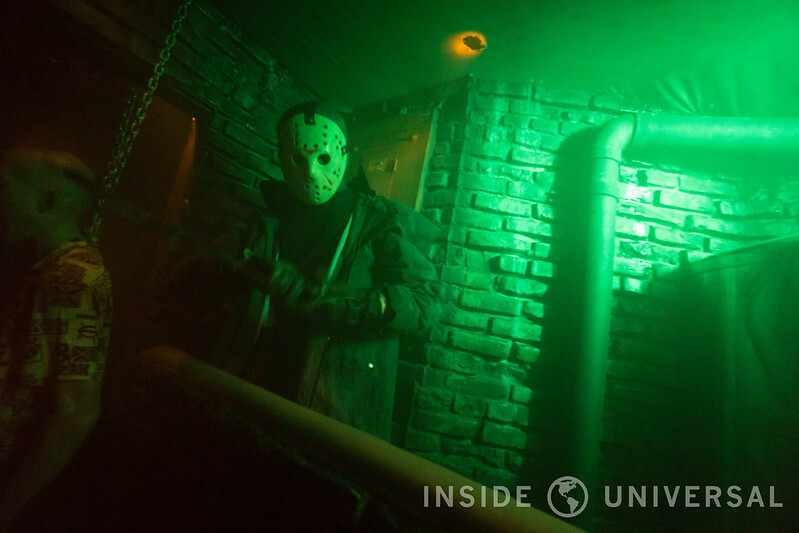 Indeed, Murdy and Williams have faithfully recreated Camp Crystal Lake, complete with E.T.-esque trees, an unearthed grave and Jason’s trademark hockey mask. With Mrs. Voorhees forcefully trying to resurrect her son, Freddy vs. Jason harnesses the power of ambiance rather than the easy use jump scares during the maze’s introductory scenes – a smart move that avoids the repetitive and dull nature of Texas Chainsaw Massacre. However, if you think Freddy vs. Jason is light on scares, be warned: both slashers make a healthy amount of appearances throughout the maze, especially during the final act. 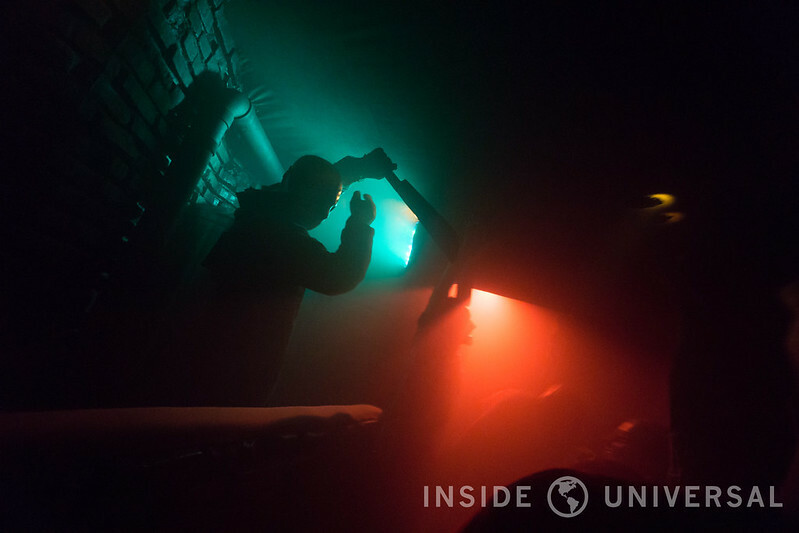 In fact, this constant dual remains a central theme throughout the experience as both icons attempt to intimidate and coerce their rival into an early death that only intensifies as the maze progresses. And depending on when you visit Freddy vs. Jason, you’ll only see one villain emerge victorious. 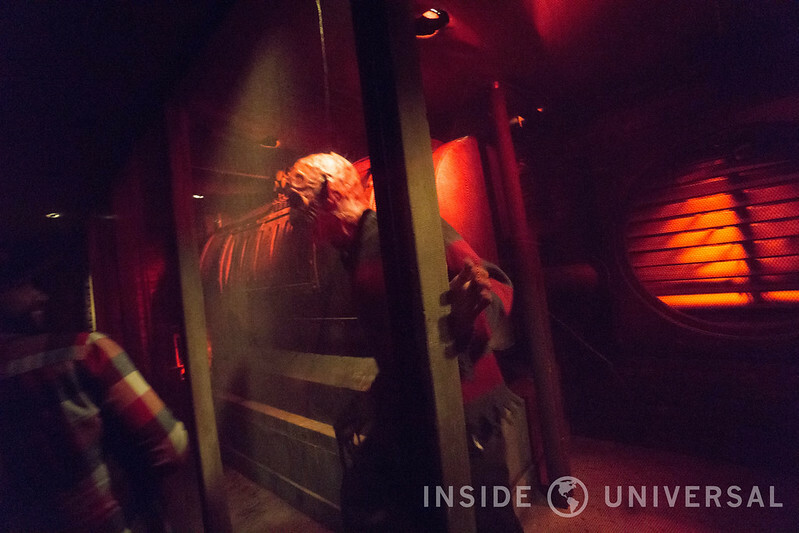 Through the clever use of faux walls and character switch outs, you’ll see either Freddy or Jason as the primary victor at the end of your experience – a nice incentive that invites return visits for Horror Nights fans. However, while Freddy vs. Jason has a few clever tricks up its sleeve, it veers into familiar territory as the maze begins its final act. As you progress further in the bowels of Craven Industries, every turn provides another opportunity for a scare, which are both unrelenting and constant. 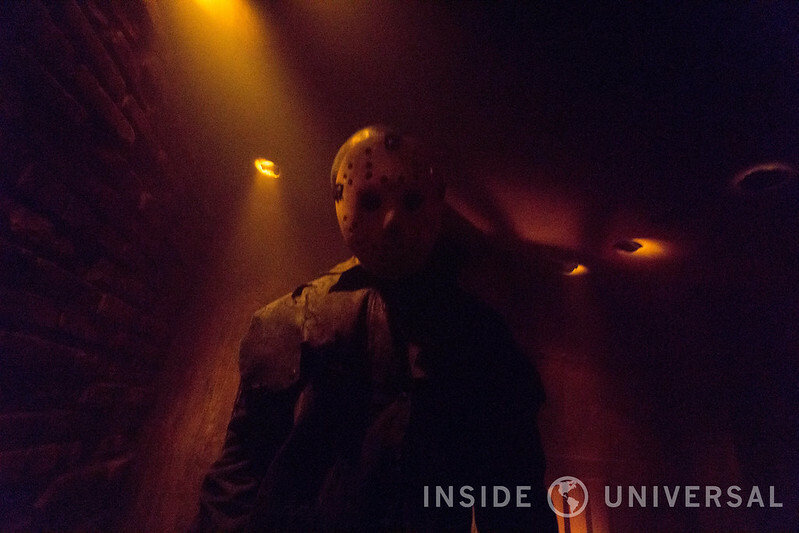 Whatever previous emphasis on ambiance is now gone as both slashers make repetitive appearances primarily through wall openings. It’s almost as if Freddy vs. Jason attempts to compensate for the fact that the maze’s introductory scenes are light – perhaps unusually so – on scares, compounding all of it its efforts into its concluding scenes. Indeed, perhaps this maze’s only downfall lies in the repetitive nature of its scares. Like we stated above, the scares are plenty, but the cut outs in the walls are noticeable and easy to spot – especially to any veteran of the event. 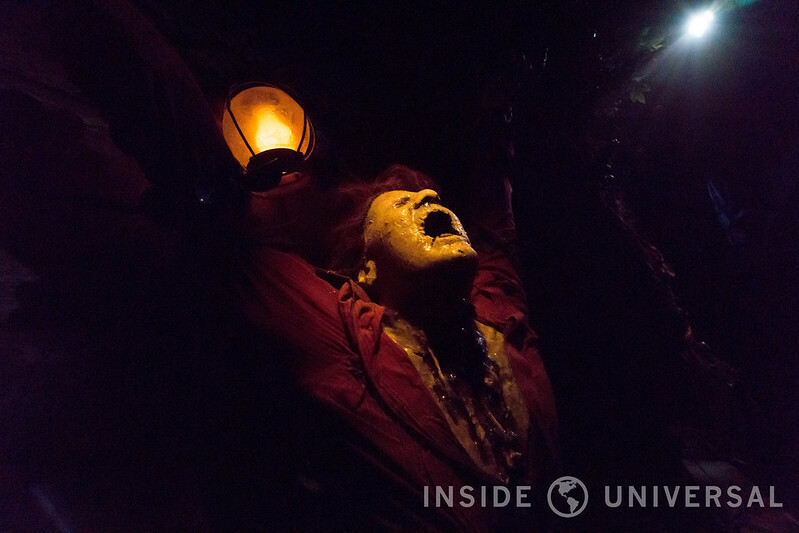 Considering this year’s refreshing emphasis on the recreation of iconic sets – The Exorcist, Krampus and American Horror Story, we’re looking at you – Freddy vs. Jason steers dangerously close to Horror Nights’ over-reliance on boo-holes. 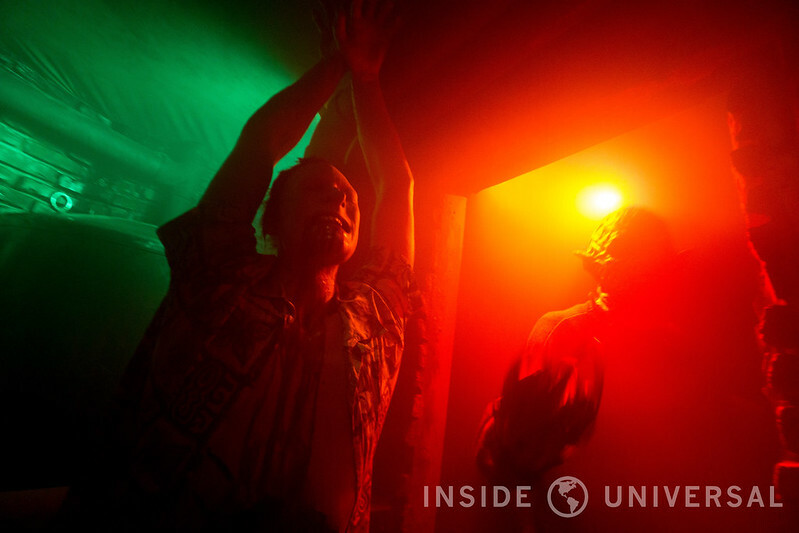 While certainly not as repetitive as Texas Chainsaw Massacre: Blood Brothers, it would have been nice to see the creative team incorporate more unique and perhaps less predictable scares with actors as guests conclude their experience. But then again, Freddy vs. Jason has always been a fan favorite, and the head-to-head conflict between the two primary antagonists provides a battleground that’s simply fun to watch, repetitive scares be damned. Unlike Leatherface and Chop Top in Texas Chainsaw, Freddy and Jason are both easily identifiable to casual fans, both featuring enough imagery that wards away any potential confusion as to which character is attacking you at any given time. 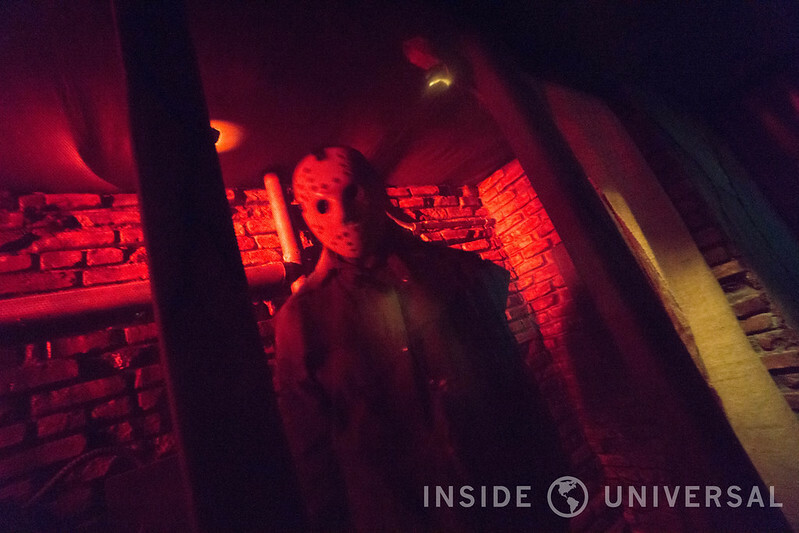 In the end, Freddy vs. Jason certainly provides a worthwhile experience that distinguishes itself from the rest of Horror Nights’ impressive 2016 lineup. 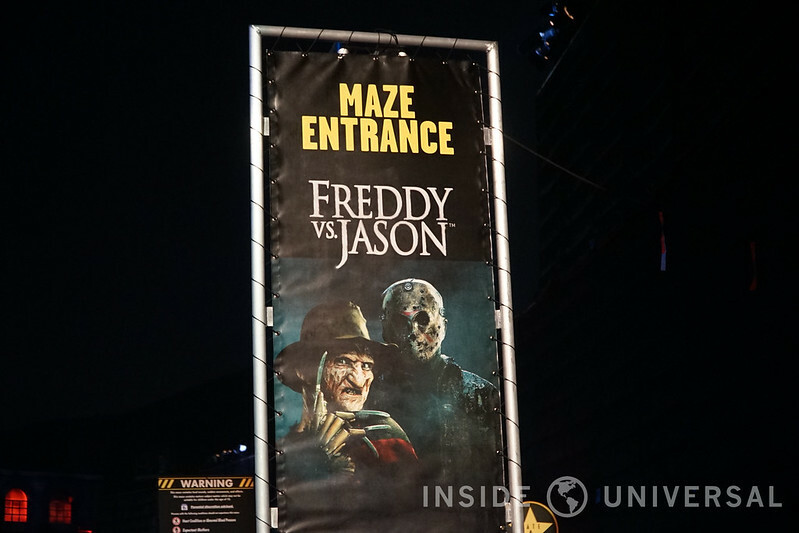 While not the strongest maze in this year’s roster, Freddy vs. Jason provides a nice taste of Halloween Horror Nights’ pre-2016, combining a copious amount of scares with a healthy dose of sets. 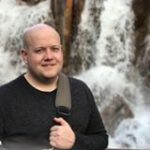 Given that we have both The Exorcist and American Horror Story on this year’s roster, perhaps Freddy vs. Jason is what is needed to create a balanced event. 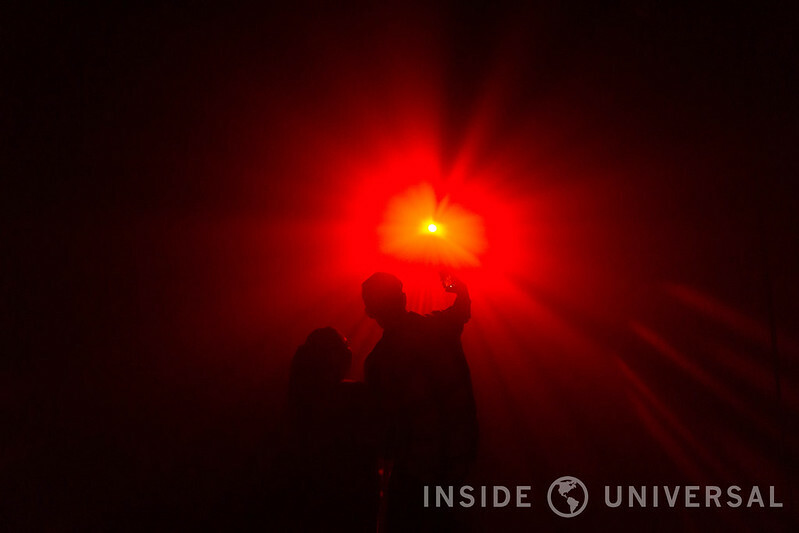 Be sure to visit our Halloween Horror Nights 2016 index for links to additional reviews, photos and highlight reels from this year’s event.